Facial Rejuvenation Acupuncture / Acupuncture face-lift is becoming a more popular, non-surgical method for those who want not only to maintain beauty, radiance and vitality in the face, but also improve their overall health and well being. Acupuncture face-lifts have even been featured in the mainstream media. Studies show that among 300 cases treated with facial acupuncture, 90 % had marked beneficial results with only one course of treatment (International Journal of Clinical Acupuncture, 1996). Acupuncture for facial rejuvenation is a wonderful, holistic, alternative approach to fighting the aging process. Increasing the flow of energy, blood and lymph circulation improves the face’s natural, healthy colour, diminishes wrinkles and eliminates fine lines. Stimulating the formation of body fluids nourishes the skin and encourages it to be moister, softer, smoother, and more lustrous. Chinese herbs work excellently in replenishing Yin energy (body fluid), which is extremely beneficial in the prevention and/or improvement of wrinkles resulting from menopause or cigarette smoking. Healing physical, emotional and spiritual issues to reduce stress and improve overall health and well being. Since the body/mind/spirit are all connected, negative emotions reflect in the face and change the appearance of skin texture, colour, and tension. Acupuncture can eliminate stress and bring out the innate strength, vitality and health. In addition to enhancing skin appearance, most people are pleased to find that their sinus problems, headaches, toothache, TMJ, PMS and menopause have either disappeared or their symptoms are distinctly improved! You will not only look younger but also most certainly feel younger. Excellent alternative approach without surgery and injection. Acupuncture is far less expensive, more natural, non-invasive and safer than plastic surgery or botox injection’s, and has no side effects, toxicity, inflammation, or recovery time. Times: 10:00am to 18:00pm, with an hour for lunch, however the workshop may run a little over these times. To enable participants to obtain a Post Grad Certificate in Chinese Facial Rejuvenation, which certifies their competence to treat a patient requiring facial rejuvenation. 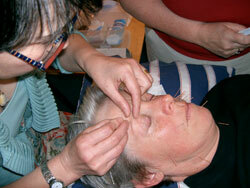 The course is designed for qualified acupuncturists only. 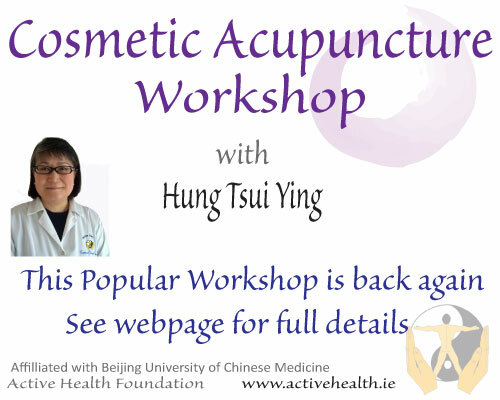 This one day intensive workshop involves advanced needling techniques, with extra acupoints not included on existing acupuncture courses. In order to enjoy the workshop fully, you should have needling experience and knowledge of commonly used acupoints. Proof of Professional Indemnity Insurance or Membership of an Professional Acupuncture Association may be requested. Hung Tsui Ying has a busy practice in Chinese Medicine in Galway. She is a respected Tuina master from Taiwan and a master practitioner in Chinese Cosmetic Acupuncture, Chinese Nutrition therapy, Gua Sha therapy, Auricular (ear) acupuncture, Chinese Herbal medicine. Tsui Ying lectures extensively throughout Ireland and England. More detailed information on Hung Tsui Ying here. Click Here. notes, practice needles and materials are included in the fee. N.B. Please note that your place is only confirmed when you have paid this fee. Policy of Payment in Advance – Why? As places are restricted to 12 acupuncturists, places are on a first come, first served basis and confirmed on full payment. If this course requires prior qualifications and we require evidence of your qualifications we will write to you separately. Pay ONLINE Now with the PayPal button below. If you don’t have a PayPal account – no worries, you can still pay by credit card on the PayPal site with NO extra cost. Click button to say you wish to pay by card only. 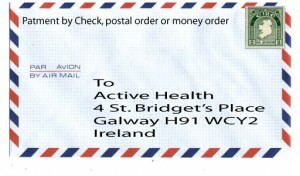 Drop a check, postal order or money order to us at 4 St. Bridget’s Place, Galway H91 WCY2. Make check payable to Active Health. Make sure you let us know who you are. Pay directly into our bank account. Please ensure you include your name with your lodgement. I will email you to confirm your place. Closer to the course, I will write to you with all the necessary details on the course. This is important Preparation Information for the course. 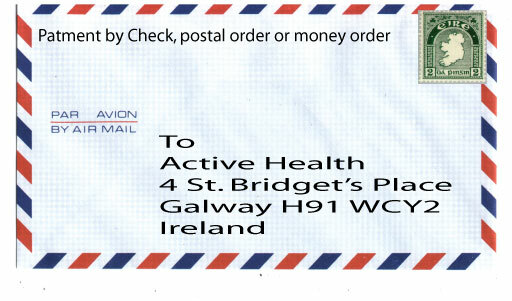 This entry was posted in Cosmetic Acupuncture on October 25, 2013 by activehealth.ie.